A new study finds that viruses share some genes exclusively with cells that are not their hosts. The study, reported in the journal Frontiers in Microbiology, adds to the evidence that viruses swap genes with a variety of cellular organisms and are agents of diversity, researchers say. The study looked at protein structures in viruses and across all superkingdoms, or domains, of life: from the single-celled microbes known as bacteria and archaea, to eukaryotes, a group that includes animals, plants, fungi and all other living things. "It is typical to define viruses in relation to their hosts, but this practice restricts our understanding of virus-cell interactions," said University of Illinois and COMSATS Institute of Information Technology researcher Arshan Nasir, who led the new research with Gustavo Caetano-Anolles, a professor of crop sciences and affiliate of the Carl R. Woese Institute for Genomic Biology at the U. of I., and Kyung Mo Kim, a senior scientist at the Korea Polar Research Institute, in Incheon, South Korea. "Recent research has revealed that organisms can form partnerships with other organisms and live in communities. For example, many bacterial and archaeal species reside in and on the human body and constitute the human microbiota," Nasir said. Viruses that infect archaea and bacteria, for example, are not known to infect eukarya. However, they may still interact in nonharmful ways with organisms they do not infect, the researchers said. "We wanted to investigate the genomes of viruses and cellular organisms to look for possible traces of gene transfer from viruses to cells, beyond what we already know about virus interactions with their hosts," Nasir said. The team used a bioinformatics approach to analyze the genomes of organisms and the viruses that infect them. Rather than focusing on genetic sequences, which can change over the generations, the team examined the functional components of proteins, which they call folds. Each fold -- and there are more than 1,400 of them across all domains of life -- has a unique 3-D structure that performs a specific operation. Because folds are critical to protein function, they remain stable even as the sequences that code for them change as a result of mutations or other processes, the researchers said. "This makes protein folds reliable markers of evolutionary changes over vast time periods, especially for viruses that mutate notoriously fast," Nasir said. The researchers found hundreds of folds that are present across all superkingdoms of life and in all types of viruses, which suggests that they came from an ancient ancestor of all life forms, Caetano-Anolles said. Some folds, however, occur only within a single superkingdom and the viruses that infect it, suggesting a transfer of genetic material only between that group of viruses and their hosts. Out of a total of about 2,000 superfamilies of folds, the team found one that was exclusive to archaea and the viruses that infect archaea, 29 shared only by bacteria and the viruses that infect them, and 37 that are exclusive to eukaryotes and their viruses. The data also point to other, as yet unknown, mechanisms that allow viruses to exchange genetic material with cells, the researchers said. "We discovered many virus-hallmark genes in cellular organisms those viruses are not known to infect," Nasir said. 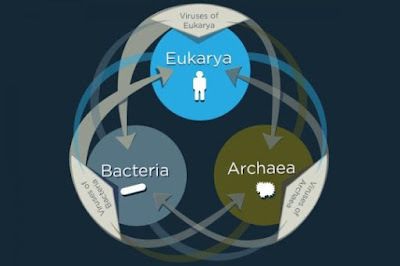 "This was especially obvious for bacterial viruses and eukaryotic organisms, possibly because of the greater number of ways bacteria interact with eukarya." "While people tend to think only about viruses that infect and kill their hosts, we have known for decades that a virus will sometimes enter into a cell and incorporate its genetic material into the cell without killing it," Caetano-Anolles said. In the case of single-celled organisms, those genes are sometimes passed along to future generations, he said. 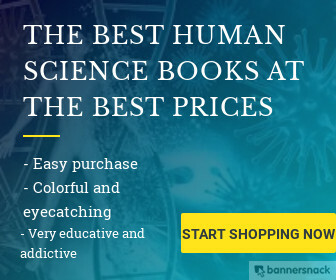 Human DNA, too, contains remnants of viruses. "Some retroelements and transposons, for example, are believed to have originated in ancient viruses," Nasir said. Retroelements are sequences copied from RNA viruses into DNA and inserted into the genomes of nonviral organisms. Transposons, also known as "jumping genes," can move from one part of the genome to another. "If you have an entity that was a virus at some point and got co-opted into the genome, that becomes a part of the molecular heritage of the organism," Caetano-Anolles said. The team also discovered a large subset of virus-specific protein folds that were not present in any cellular genomes. "This suggests that viruses can create new genes and, potentially, transfer those genes to cellular organisms," Nasir said. The Higher Education Commission, Pakistan; the U.S. National Science Foundation and the National Institutes of Food and Agriculture at the National Institutes of Health supported this research.